The unit on the left is the end of a Model 30 mainframe cabinet. 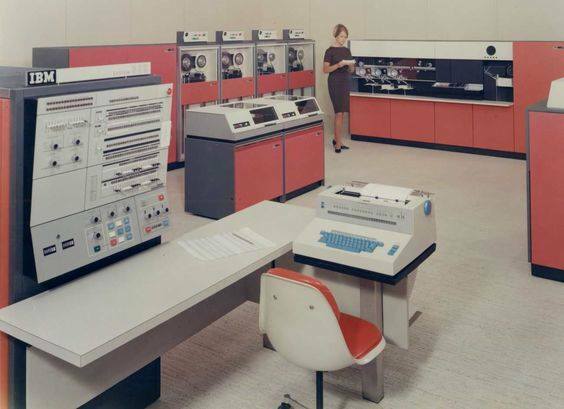 In 1964 IBM introduced its System 360. 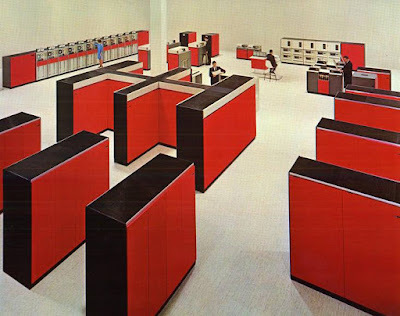 It was a range of mainframes that all ran the same instruction set and were compatible with the various peripheral units. The two low units in the middle of the picture were disk drives. A disk consisted of 5 or 7 platters (my memory is fuzzy) and were 14" in diameter. I believe they held 7 megabytes. You could turn the unit off, lift the lid and remove the disk with a special cover attachment. The number 2311 is rattling around in the back of my brain as the model number for that type of disk drive. Model 30 was the smallest (and slowest and cheapest) of the models. It was an 8-bit computer emulating the 32-bit instruction set of System 360 with microcode. I worked off hours in the business office of Northwestern University to run some jobs on their Model 30. Basically, I was paid to do my homework. I spent many hours in college setting at that console desk. Model 40 was a 16-bit computer emulating the 360 instruction set. I worked one summer in the engineering group of the consumer division of Magnavox in Fort Wayne, IN working on Fortran programs. The computer we ran our programs on was a Model 40. A Model 50 was a 32-bit computer. I presume that Models 65 and 75 were 32-bit computers with additional logic such as pipelining and/or hardwired multipliers to improve their speed. I don't know if there was an 85. Model 90 was considered IBM's supercomputer. It would be interesting to know what generation of smart phones had the computing power of a Model 90. The second picture is obviously one of the bigger models. The unit along the back wall was another disk drive, I think a 2314. Each "window" was a drawer that held a disk. The disk was twice as high as the disk used by a 2311 so it held 14 megabytes. When I went to work at Bell Labs in 1973, we had a Model 67. That was a Model 65 with additional instructions added to support the Time Sharing System (TSS) to compete with Multics that MIT developed on a GE computer. That unit was the same red as these units. They quickly ordered a second unit that came in factory blue. I think IBM offered two more colors. When we ordered our next unit, the comp center manager had someone buy cans of spray paint to put a fifth color in the computer room. By this time Unix became mature enough that we started buying lots of minicomputers. So I think we peaked at five colors. I not only did a lot of programming with the IBM 360 assembly language, I used the COMPASS assembly language for CDC 6400 at Northwestern University and CDC 6500 at Purdue University. When I first started at Bell Labs, we were still using IBM 360 assembly language. I could probably still read an IBM program. I don't know if I could still read a CDC program. Fortunately, I'm sure I'll never have a chance to find out. Is USA loosing another manufacturing capability?